A few years ago we organized a very last minute vow renewal for a couple coming off the cruise ship. This isn’t too unusual but what was a little strange was that they had a really good sized group with them – usually things are planned a little further ahead. I can’t remember the exact details but it turned out their ship had changed course and they weren’t going to the original island where their vow renewal was planned so they called me, literally, the day before their ship was to arrive. Actually…as I’m writing this story, I realized that I had blogged about their wedding! I went back to our old blog site and found it here. http://www.islandblissweddings.blogspot.com/search?updated-min=2010-01-01T00:00:00-08:00&updated-max=2011-01-01T00:00:00-08:00&max-results=50 (sorry, my link function isn’t working for some reason). How cute are they? Like seriously. This is one of those weddings that my husband and I never forget and every once in awhile will say, “remember that couple that renewed their vows on Brewer’s Bay….” and we pretty much know exactly who the other is talking about. They were SO in love, after 52 years! Michael and I wanted to thank you from the bottom of our hearts for making our Wedding day beautiful and so special. I could not be more happier and we couldn’t ask for anything more. The ceremony was absolutely amazing and gorgeous. The site, the flowers, the arch, the isle decor was exactly what we imagined and asked for. Your attention to detail and care ensured that our day was enjoyable and stress-free for everyone. Everything was a seamless process like you promised! Also Stuart made our vows so personal and special and we are so thankful for that! Thank you so much for making our wedding day memorable. 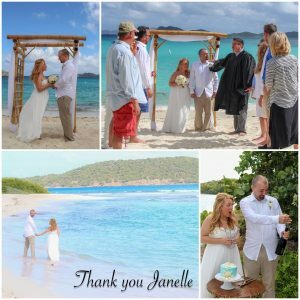 I would recommend you to anyone who is considering having a beautiful destination wedding and we hope to renew our vows in the future with you! It’s snowing here right now so I am defiantly missing the Caribbean but the pics will make me feel like I’m there again. And please feel free to use any pictures you please for and website or blog. I want to send them everywhere so more people know how wonderful you and your team truly are. Than you from the bottom of our hearts! Thank you so much Jessica! And I look forward to seeing you at your vow renewal! !